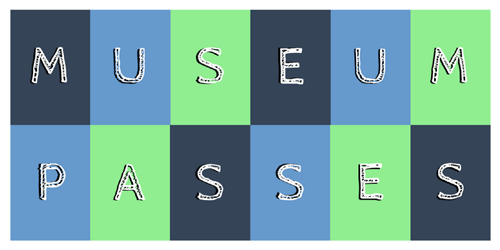 Museum passes are available to Comsewogue Public Library cardholders who are 18 years or older and in good standing. TWO different museum passes may be reserved in a 30-day period by the same household. PRINT-ON-DEMAND PASSES: Passes may be reserved up to 30 days in advance and can be printed from home any time or at the library (during normal business hours). This pass will only be valid for the Date of Pickup listed on the confirmation page. The reservation is to be made for the date the cardholder wishes to visit the museum. These passes MUST be presented in printed format—electronic versions (on smartphones or tablets)—will not be accepted by museums. Print-on-Demand passes do not need to be returned, therefore there are no late fines for them. For more information, click here to view the terms and conditions of reserving a Comsewogue Public Library Museum Pass. Pass admits 2 adults and any number of children 17 years and under for free. Also provides 10% discount at the garden shop and cafe. Pass admits up to 4 people (2 adults and 2 children or 1 adult and 3 children) for free. Also provides 10% discount on CMOM Store purchases, as well as additional discounts at local restaurants and entertainment venues. Click here to view the full list. Pass admits 2 adults and 4 children for free. Pass admits up to 6 people for free to museum (open mid March - December). Pass admits 2 adults for free. Children under 10 are not admitted. Also provides 10% discount at the Museum Shop. You must print this pass. It serves as your entrance to the venue. Please present this pass to the membership desk upon arrival. Pass admits 2 adults and children under the age of 18. Free admission to ALL events for pass-holder and 3 guests. Reciprocal membership is available for cooperating museums. For more information or a full list, please see circulation. Pass admits 4 guests, ages 3 and over, for free. Children under 3 years of age are admitted for free. Pass admits 2 adults and up to 4 children (between the ages of 10-18) for free. Due to the nature of the exhibition content, admission is not recommended for children 10 and younger. **PLEASE NOTE: To validate admission into this museum, you must bring the library card used at the time of reservation to the museum. Pass admits up to 6 people to the museum, Growler submarine, and Space Shuttle Pavillion for free. Pass admits 2 adults and their children. Admission to the Jewish Museum is FREE on Saturdays for everyone (no pass needed). Pass admits up to 6 individuals for free. Pass admits 2 adults and any children under the age of 18 for free. Also provides 10% discount on LIM merchandise. Pass admits a family of up to 6 people: 2 adults and 4 children. Pass admits 2 adults and up to 4 children for free. Pass allows entry of the vehicle when the card is presented at most New York State Parks, Dept. of Environmental Conservation forest preserve areas, boat launch sites, arboretums and park preserves. Please check ahead of time to make sure the area you want to visit accepts the Empire Pass. **NOTE: This museum pass is checked out for 7 days. Pass admits 4 visitors during normal museum hours for free (open April - December). This pass is not valid for certain dates and special events, including, but not limited to: Woodstock Revival Festival, The Long Island Fair, Chocolate Festival, and all Halloween Events. Pass admits 2 adults and their children for free. Also provides 10% discount in the garden/gift shop. Please note that an Old Westbury Gardens pass will NOT cover The Rise of the Jack O'Lanterns and other special events! Pass can be used for The Picnic Pops and the LI Scottish Highland Games, but the applicable 'member rate' will be charged per person. Pass admits 2 adults, their children under age 16, and up to 4 grandparents for free. 10% discount on all gift shop items. Not valid for admission for museum walks, talks, presentations or other programs. Pass admits 2 adults and 4 children under the age of 18 to the Estate grounds and Museum exhibits for free. Also includes free admission to one Planetarium show per person. Pass admits 1 family, up to 6 people from one household, for free. **Please note: Pass is not valid for special events or programs where paid admission is required.